First of all, Russia is updating its nuclear arsenal anyway. Putting aside whether these fabled BMD-beating missiles would anyway work as intended — the miserable development history of the 3M30 RSM-56 Bulava (SS-NX-32) is a cautionary tale against assuming Russia can deliver world-class technologies these days — this is essentially Putin repackaging existing deployment plans as if it were some new initiative. In other words, he hasn’t anything new to offer. Secondly, nuclear weapons are that contradiction in terms, an unbeatable weapon that cannot be used. Unless Putin seriously intends to risk global thermonuclear armageddon (something that would have even his generals and cronies thinking twice), of which there is no credible hint, then they are essentially (a) to protect the homeland against existential threat and (b) for posturing. Given that there is no threat of any invasion (no, InfoWars, it is not the case that “Mounting evidence suggests US-dominated NATO heading for direct confrontation with Russia”), this is rather an attempt to worry the West. Putin knows that using the n-word — nuclear — gets us sitting up and paying attention. But essentially, this is just a bit of martial PR, rattling a sabre that he cannot use and which will have no effect unless the West allows itself to be rattled. How is this encouraging? In comparison with possible alternatives. Had Putin instead announced something that was both new and usable, such as moving a Spetsnaz unit close to the Estonian border, or offering a thousand scholarships to Russian-speaking Balts to come study in Russia (where they could be indoctrinated, recruited, and trained), then I would have been more worried. I’d been thinking this same thing about Russia and nukes for over a decade now- I couldn’t understand why they constantly crowed about developing new nukes(e.g. Topol-M) when they’re conventional forces, i.e. things they could use, were so weak compared to the US. Remember the debacle with that AN-94 service rifle? They’re STILL using the AK-74M for the most part, and it STILL has the same problems that AK’s have always had (yes, AK fanboys, AKs have disadvantages). What I could never understand is how they could watch everything the US did from the Gulf War to the present with conventional weaponry, and not decide that putting more effort into conventional cruise missiles, missile destroyers, fighters, strategic bombers, UAVs, etc. was the better way to go. The deadliest weapon you can’t use is worthless. The US goes for “100%” solutions. As a result you get things like the F-35 and F-22, which take two decades to go from plan to flying, cost $120-$220 million per air frame, utilize technology that is revolutionary, and are years behind schedule. But the US get’s simply put, the best money can buy and the most advanced the human race can create. Russia by contrast goes for “80%” solutions, with the goal being that that extra 20% they give up means the platform comes sooner, cheaper and in greater numbers. The T-50 for example, was going to be less advanced than the F-22, but build in greater numbers and better than anything not named F-22. The problem is as Russia has found out with Bulava, with Borei, with PAK FA, with T-95, that “80% solutions” for modern systems are still ridiculously expensive, incredibly difficult to develop and likely out of their financial and technological means. A more realistic goal might even be a “60%” solution. You know what the next victim is going to be by the way? Armata. Why? Because the US tried what Armata is attempting to do: replace all the vehicles in the Army with one family of vehicles built on a common chasis with different parts. The US called it the Future Combat System. It was a fiasco that was canceled. The US build dozens of FCS prototypes, before killing the program billions of dollars later. Just watch, Armata – an “80% FCS” – will go the way of every other recent Russian attempt at doing 21st century modernization on the cheap, and be canceled in favor of more “Modernized T-90s”. Simply put, the US spending $600-$700 billion a year on it’s military (dependening how you count it) is not some accident of nature or politics. It is what it costs. It should be higher. It should be closer to $850 billion. The US is already going to face a few-year shortfall in ships and fighters in the early 2020s due to the retirement of 1980s platforms and the reception of 21st century platforms after 2025, simply because it is building 2 attack subs per year, not 3, and buying 56 fighters a year, and not 70. Russia tries to do a full scale modernization on an $80 billion a year military budget… and you’re surprised that program after program fails or is delayed? Here is my advice: don’t be suckered in by their government’s boasts about what they plan to buy. The US Government and Lockheed Martin can actually fight when the F-35 gets screwed up. Russia’s arms industry is state a state owned enterprise. The people saying “nothing is wrong with the PAK FA, trust me, I’m your defense minister”, is also the person selling the PAK FA to the Russian government. The US under NewSTART is planning to have 1550 warheads and just shy of 800 launchers (the treaty limit). Russia under NewSTART will have 1550 warheads and under 500 launchers. Launchers are defined as a ICBM, a SLBM or a Bomber. Why the disparty? Costs. The US began the process of consolidating launcher types in the 1980s. The Navy uses one “launcher” (Trident II D5); the Air Force uses the Minuteman III; there is one type of ALCM for use on the B-52, and there is the B-2. That’s it. Russia by contrast operated 4 different incompatible families of SLBM, three different types of land based launcher. Russia’s military modernization has been slowed, for decades, by having heritage hardware, but not wanting to rid itself of it because doing so would be unilaterally disarming.In retrospect NewSTART was a hell of a canny deal for the US. Russia desperately needed it because it needed security cover to retire classes of submarines and SLBMs. They planned to achieve parity with the Borei-Bulava combo (emulating Ohio+Trident), but to say both programs have been troubled is an understatement. In 2013 the US Navy conducted over 60 nuclear patrols. The Russian Navy conducted four. 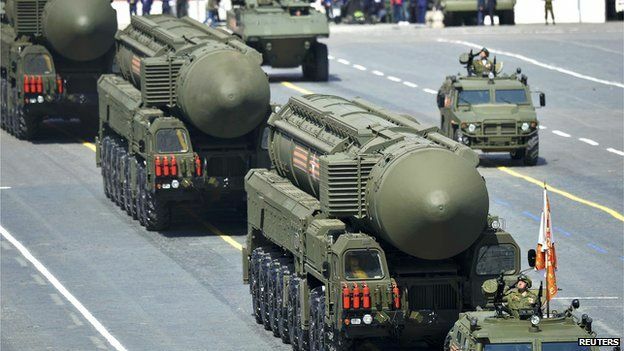 If the future of Russia’s nuclear deterrent is in part, based on Borei and Bulava, then there isn’t very much to fear. Even once they’re not malfunctioning every other test, they will need to actually, you know, patrol, which as we see has been a Soviet Union thing, but not a Russian thing. I think one important thing people often forget is the human factor. Most Russian soldiers are conscripts who serve one year. In that time they suffer abuse, corruption, and poor conditions. By contrast in the US you have volunteers, and believe me you can see people getting very motivated at some of the most boring MOS’s. That’s not all- the amount of knowledge acquired in Afghanistan and Iraq is immense. Within a few years of the Iraq war I no longer recognized the American soldier or marine or their tactics. All this jargon and methodology arose that I’d never been taught in basic training in the peace time army. A weapon is only as good as the person using it. Agree with many of your points, but I wonder if there is a risk that we are ‘mirror imaging’ Putin regarding the usability of nukes. Just because the Western countries would not use them for war fighting or coercion, does not necessarily mean that all our opponents think exactly the same way. Certainly after the Cuban Missile Crisis cooler heads prevailed over the role of nuclear weapons, even though there were a few near misses – 1983 Able Archer being the most significant of those. But current Russian nuclear doctrine suggests reliance on nuclear weapons in the face of major conventional threat. How does Moscow define ‘major conventional threat’? I don’t think that anyone in the West is thinking of invading Russia (not a good idea as has been shown by history), but from the perspective of decision-makers in Moscow it genuinely may not be so clear cut. I strongly disagree with the perspective that this crisis in Ukraine is NATO’s fault and Russia is the victim – NATO is not an aggressive alliance bent on building empires and every new member sought to join the alliance rather than being forcibly incorporated as was the case with the Warsaw Pact – but I also acknowledge that what matters is how key decision-makers in Moscow see things, not how we see things. If their perception is very different from what we are assuming it to be, and if their thinking on possible responses is thus very different from what we assume they would be thinking in terms of nuclear weapons, there is a real risk of miscalculation. I think it is entirely justifiable for NATO to pre-position heavy armor along its eastern frontier to deter Russia from launching special warfare in the Baltics. But from the vantage of Moscow’s perception, that increase’s NATO’s ability to launch military operations against Russia, including threatening St. Petersburg in a major crisis. Put that together with strong pressure on Obama to arm the Ukrainians in the face of Russian aggression in the Donbass, and things seem to be building up – are we both stumbling towards a dangerous crisis through misperception and miscalculation? That’s generally how wars start, and once they start, the escalatory pressures may increase, especially if the Russians could not counter stronger NATO conventional forces with conventional forces alone. So what is Putin to do? He can’t back down and survive politically. His only option would be to force a humiliating strategic back-down on NATO’s part, in a manner that would completely undermine the credibility of the alliance. To do that he has to raise the cost of any NATO response to unacceptable levels. Rattling nuclear sabres – for real, not just for show – would do that very nicely. He may feel that he has escalation dominance, because his perception is that NATO is weak, and disunited – they have no stomach for a fight. So he can coerce using nuclear threats because NATO will blink long before we get to the point of arming missiles and pressing red buttons. If NATO backs down in the face of Russian special warfare in the Baltics, especially under Article V conditions, the Alliance is finished. It has no credibility left, and confidence in the US in particular would be at an all time low. Putin wins a major strategic victory, and may be embolded to go further, backed up by a demonstrated willingness to use nuclear coercion again, and in the process weakening perceived taboos on the role of nuclear weapons. Where might he do this? Restoring direct Russian access to Kaliningrad through Lithuania, or Poland? Extending Russian control to Odessa and thus cutting Ukraine’s access to the Black Sea whilst linking up with Trans-Dniester? A post-Baltic crisis scenario, in which Russia coerces through active and demonstrable nuclear threats – perhaps even a ‘warning shot’ – becomes very dangerous indeed. To avoid blundering into this situation I think the West should stop making assumptions that the Russians would never use nuclear weapons in any other capacity other than nuclear deterrence. Nuclear coercion may be open to them if they know that the US and NATO won’t respond in kind. Let’s not blindly stumble into a nuclear crisis by mirror imaging Russia’s actions and choices. Sorry, am I misunderstanding, or are you suggesting that I am presenting this perspective? It’s certainly not my view, nor anything I have said. Please ‘bear’ in mind – that the NATO philosophy was we can hold for 30 hours then we move to Nuclear Battlefield weapons. Putin is using NATO’s information against NATO. What he is using is that the EU unless driven by Germany could not stitch up a loose thread. He can get into Greece, Cyprus and Hungary any time he wants and those he will target to cause trouble. Our late Eastern German friend is doing her best to help him. Hardly; today’s Russia has nowhere near the conventional military capability of USSR+Warsaw Pact, and frankly its intervention forces are nearing overstretch simply in Ukraine. The parallel with NATO doctrine then really doesn’t work. Mark, no definitely not suggesting that you are promoting such a view. I read your material regularly and like your work. My comments about the perspective of ‘Russia as a victim’ reflects some of the tone in various articles and commentary by other writers who claim NATO expansion is the cause of this crisis. Such a view is at odds with reality. What is your opinion of this article put out by Vox (http://www.vox.com/2015/6/29/8845913/russia-war)? Is Russia on par militarily with the scenarios outlined there? Is this an example of the threat being bigger than the rhetoric, or the rhetoric being bigger than the threat? I hope to have the time to write something on this shortly, but in brief I think it’s pretty insanely alarmist. I have no idea if Russia offers scholarships to russian speakers in baltic countries, but 1 million Ukrainian refugees in RF should have precisely the same effect.